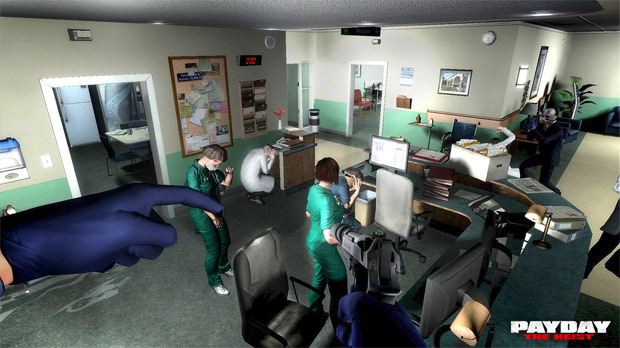 That collaborative Mercy Hospital Heist for PAYDAY: The Heist is now available for free on Steam. The original reveal for this content was rather unexpected, but I've since grown to like it, conceptually. The fact that it doesn't cost anything to play certainly helps. In addition to this mission, Overkill Software has added a new zombie theme and, for those of you with Left 4 Dead or Left 4 Dead 2 installed, wearable in-game zombie masks. This content is all wrapped together nicely in an update for PAYDAY, so you won't even have to seek out a download link. A future patch will add further challenges and Steam Achievements, according to Overkill.